Nutgrass (Cyperus esculentus and Cyperus rotundus) Nutsedge also called purple or yellow nutgrass are perennial sedges introduced from Eurasia. They spread by seeds, nutlets and creeping tendrils. They like wet, anaerobic soils and that is a key to control. They are perennial pests in lawns and gardens. Erect, single, triangular stems have narrow, grass-like, yellow-green leaves. Leaves point outward in 3 directions. Booms in late summer to early fall. Seed heads are yellow-brown. Plant tops die back in the fall, leaving underground tubers to over winter in the soil and repeat the cycle the following year. Nutgrass reproduces by seeds as well as tubers, which are generally the size of popcorn kernels. Weeds sprout in late spring and early summer. 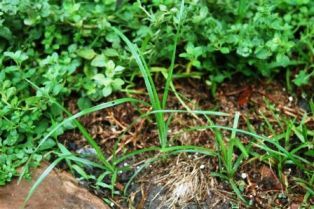 A single tuber of yellow nutsedge is capable of producing 146 tubers within 14 weeks following planting and can infest an area 6 ½ feet in diameter. We used to say that there's no good organic or toxic chemical solution for nutgrass. On the toxic chemical side, that’s true. The commonly recommended chemicals are Image and Manage. Most everyone in the landscape industry agrees that Image doesn't work on one of the most common species. Manage works better but will severely damage or kill your trees. We have had luck and others have reported success by killing nutgrass with kindness. Mow, clip or pull as often as you can and apply a heavier than normal application of dry molasses. Use about 20 lbs. per 1000 sq. ft. and repeat in two weeks. The mixed products that contain molasses and cornmeal will also help. The idea is to stimulate a furious level of biological activity aimed at rotting the crowns of the weeds. Another remedy is to remove the weed physically with mechanical devices. In beds cover the weeds with newspaper and mulch. Spot spray with the vinegar herbicide formula or other organic herbicides such as BioSafe. For turf, overseed problem areas with ryegrass in the fall. Applying corn gluten meal in the spring at 20 pounds per 1,000 square feet prior to seed germination is also helpful to prevent additional seed from germinating. 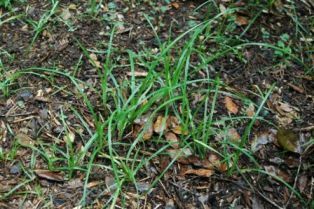 An important point to remember is that nutgrass (nutsedge) grows primarily in wet, anaerobic soil. Try applying hydrogen peroxide, the 3% kind at the drug store, full strength to the problem areas. Also let the areas dry out better between waterings, improve soil health, improve drainage and help the soil to drain better. The best control appears to be molasses, believe it or not. Drench problem spots with liquid horticultural molasses at ¼ to ½ cup per gallon of water. Start with about a gallon of drench per 9-10 sq. ft. This simple technique fires up the microbes in the soil and the nutgrass simply fades away.